We had a busy December with three musical evenings. On the 1st we could be found at Dobbies Garden Centre (Birtey) in uniform and tinsel singing carols to support their "Ladies' Evening" raising money for the Teenage Cancer Trust. On the 10th we managed to give our delayed concert from last year at Witton Gilbert Anglican church. This gave us extra impetus for our main Christmas concert in Chester-le-Street Methodist Church on the 17th: the clash with the "Strictly" final is easily avoided by using catch up services ;). Feedback from many in the audience was this was our best concert in a long time. So John Rutter's music must be appreciated - he had a staring role in our programme! We had a welcome return to Whitworth Church in the grounds of Whitworth Hall. 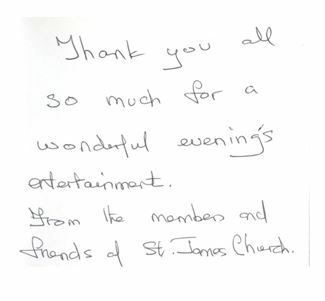 Once again we had a lovely attentive audience, and a fabulous supper provided by the church community. A "thank you" message from our audience. We had a lovely concert at St James' Church in Burnopfield starting with a selection of pieces from "Les Miserables" and ending with "Morte Christe" (and audience participation). There was a great variety between these points including solos from choir members and a ragtime piano duet from our conductor and accompanist (Tony and Janet). We were scheduled to have two concerts, on at Witton Gilbert on the 12 December and one on 19th December at our "home" - Chester-le-Street Methodist Church. Sadly because of seasonal, but very heavy, SNOW we had to cancel the outing to Witton Gilbert and so offered those who had bought tickets the chance to use them at our main concert on the 19th. We were pleased that some of the audience managed to take advantage of that offer and we would like to thank them for their support and understanding. The concert at Chester-le-Street was a lovely event and we had a large and appreciative audience - despite competing with the "Strictly Come Dancing Final"! The choir performed a mix of accompanied and unaccompanied pieces. The main support was given by our talented pianist (Janet Trewick) with some pieces having additional colour added by musical friends of the choir playing bass guitar, flute and piccollo, cello and percussion. A number of audience members commented on how this variety had enhanced their enjoyment. The evening was rounded off with post-concert refreshments including the traditional mince pies and chocolate logs. 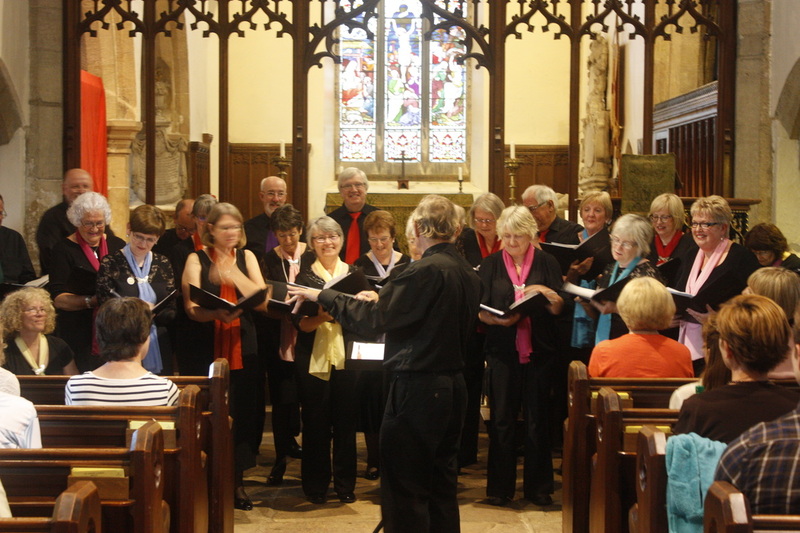 The choir combined a social day with a joint concert in Ripley church with their Benefice Choir. It was a gloriously sunny day in the very picturesque village of Ripley. We celebrated the summer with an entertaining and informative guided tour of Ripley Castle (well worth a visit) followed by a lunch there and a stroll around the grounds. 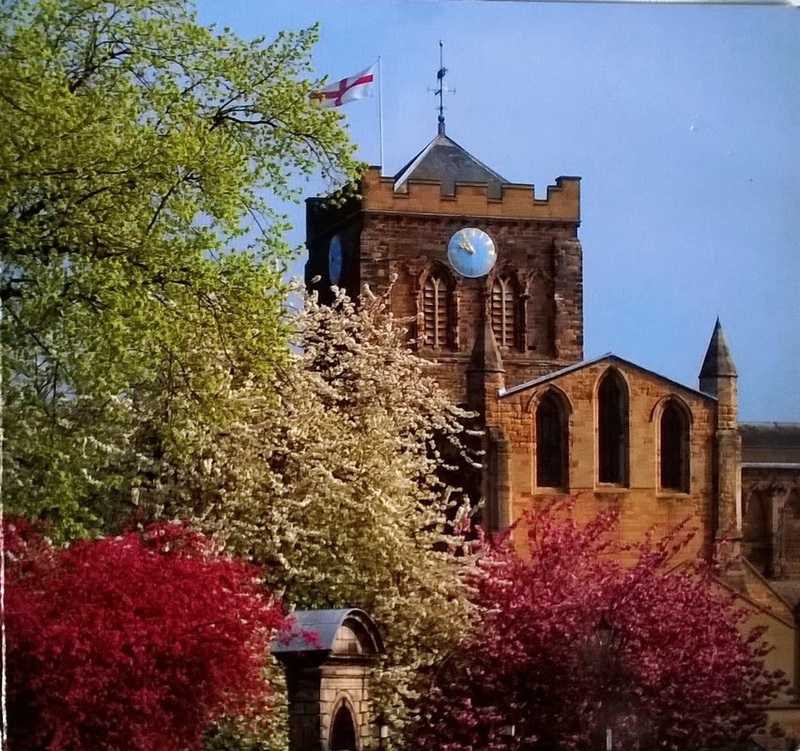 The 'Songs of Summer' evening concert was held in All Saints historic church in aid of a Christian Aid Community Partnership Project in Burkina Faso. Not only was there great music from both choirs but also tasty refreshments: providing food for both body and soul. Being lazy this report is simply the feedback sent to us after the concert by the organiser. Thank you once again, it was an evening to remember." 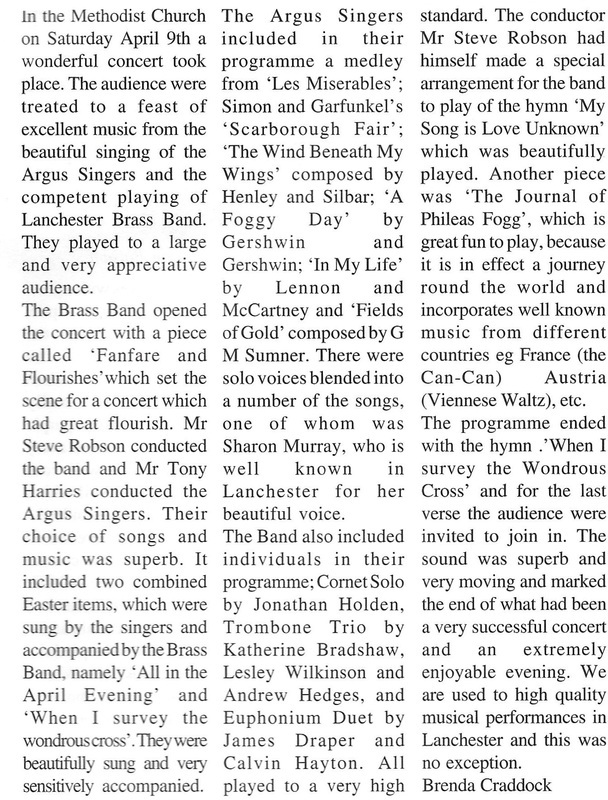 Our first major concert of 2015 was at Annfield Plain Methodist Church on 28th March. We sang to a very appreciative audience, with our usual varied programme including new songs for this season such as ‘Wherever you are’ (the Military Wives number one from Christmas 2011), and a medley finale from West Side Story. The concert marked the fulfilment of two ambitions for one of our members: Ian Murray (bass) had long wanted to bring his choir to perform in his church, and this was also his debut as a conductor for a group of pieces, a selection of North East songs. In his vote of thanks at the end, a representative from the church made particular mention of our performance of ‘When I survey the wondrous cross’, using a setting normally sung by male voice choirs. It was, he pointed out, a most relevant and uplifting piece to include in the week before Easter. The choir gave its annual Christmas concert at its "home" venue on 20th December. As usual we performed a diverse mix of religious and secular, old and new pieces. To keep us on our toes we had learnt some new pieces this term which were appreciated by the audience. We had a lovely audience of around 100 who also joined in with some traditional carols and sang with gusto. A fine preparation for Dec 25th! ... Don't forget to put next year's concert in your diaries.